Sports authorities are taking action to stop illegal live coverage of football and other events over the internet. 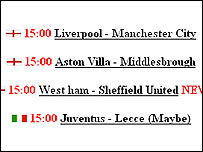 Almost all English Premiership matches are available to watch live and for free, as are other leagues and sports. The coverage, mainly from Chinese sport channels, is put on peer-to-peer applications and can be watched anywhere in the world. 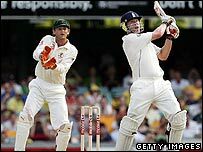 As well as football, some sites are also claiming to offer live cricket action from The Ashes in Australia. The FA Premier League, Uefa, Cricket Australia and other sport bodies have employed a company called NetResult to police the internet for unauthorised video. Some websites provide direct links to each match, only requiring the user to download a free peer-to-peer program. NetResult's Tim Cooper said it had seen "good success" in stopping broadcasts on the Chinese services, but it was an "ongoing challenge". "We're gradually working the numbers down and down, so unfortunately it's a bit of a lengthy process," he said. "You could shut a website down today but tomorrow another 10 will appear. "We're fighting a continual battle because people will always try and jump on and off certain services and new technology is always evolving." Premiership matches that kick off at 3pm on Saturdays are not shown on TV in the UK for fear that stadium attendances could suffer. But most are available on the peer-to-peer services. Mr Cooper said NetResult was in constant contact with the managers of peer-to-peer applications like PPLive and PPMate to have illegal content removed. Some matches are also streamed directly from individual sites and NetResult said it was lobbying internet service providers to shut these down. Premier League spokesman Tim Vine said most offending sites had been taken down for contravening intellectual property rights. "It is clearly a difficult area to patrol," he said. "However, we will continue to make every effort to protect our rights holders and clamp down on these sites." No live Premiership matches are yet available legally online anywhere in the world. But from next season, Sky and Setanta Sports - who have won the rights to show Premiership matches on TV in the UK until 2010 - will also be able to broadcast them legally on the internet. NetResult is also trying to stamp out illicit live coverage of The Ashes. "At the moment there are some sites that are offering it," Mr Cooper said. "But the majority of them we're managing to shut down in swift time." The BBC has the rights to stream recorded highlights to UK internet users, while Sky Sports is sending clips to mobiles.